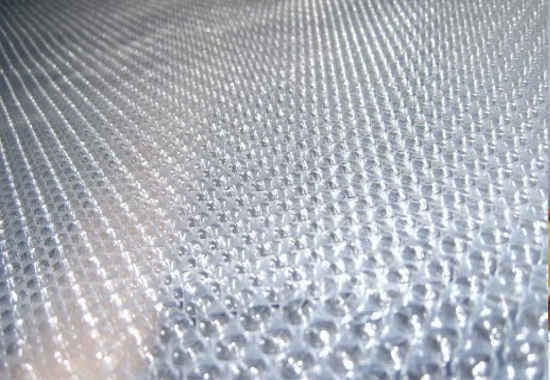 Bubble or aerobol or just bubble film is the perfect protection when packaging products from all sectors of the global industry, ranging from electronics past glassware, lighting, furniture, machinery, agriculture and many others. The modern Italian line that we have bought in order to produce aerofoil is giving us the opportunity to satisfy all the requirements of our clients. DENSITY: 50 g./ sq.m. Up to 150 g / m2. * sticking together with aluminium foil- one-sided, two-sided and two-sided sticking sandwich of bubble is one exclusive shielded isolation. * installing and launching the new line with its maximum width of the foam 2600 mm without conglutinations , the production of aeropack increased in agriculture many times as a foil for glasshouses.